First 45: "Yesterday"/"Act Naturally" with picture sleeve, at Musicland in Riverside CA. 49 cents on sale because it was in the Top 10. First album was "Help!" for $2.99 from the same store. First Concert: Led Zeppelin/Jethro Tull, Swing Auditorium, San Bernardino CA, August 8, 1969. Tickets $3.50 each. First Radio Gig: Weekly Top 40 Countdown Show, KACE-FM, Riverside CA, February 1970. First song played: "No Time" by the Guess Who. Currently: Program Director/On-Air Personality, KTYD, Santa Barbara CA. 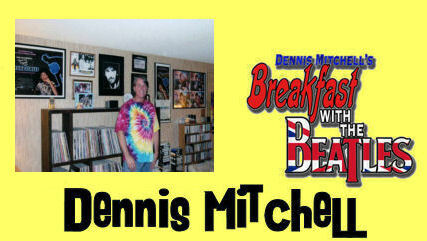 First Breakfast With The Beatles show: January 6, 1991.